Did you ever ask youself, why do you kite? Well, riding around, breathing in the fresh sea air is nice, but what is the real pleasure? Right. Doing something new. Improving. Feeling your progress. A new trick done or an old move improved. That's when you feel more control over your equipment. Easiness. And the other feel it to, looking at you. That is the difference between the beginner and the advanced one. That's not about craziness, but about easiness and beauty of your riding. But for some reason, everyone wants to Learn to be a Beginner (you can see them at any kite school), at the same time, very few of us want to Learn to be Advanced. Yes, it's also an education, that's why you see so much of Beginners around you on the spot. So, it's quite easy to start to shine among them. Start Learning to be Advanced. Do you think there is ONE MAGIC advice for jumping high? Some secret move of your back leg? Special push off the water? Ok, here it is: ... Oh no, how could I forget. There is not. No single, universal tip. And don't get me wrong, I'm not trying to hide the secret from you! The thing is, that there are about 20 basic elements in your stance and the way you fly your kite that effect the overall height of your jump. And 2 levels of jump technique you can master during our kite camps. It's not possible to say, what you have to work on more, without seeing you riding. If it was so easy, than everyone would jump like crazy. But do you know a lot of people, who are able to jump at least 5-7 meters high 5 out of 5 tries, if the wind is enough? Do you meet them on the water every day? I don't think so. Because it's not easy to master on your own. My program includs up to 15 steps to walk through, if you want to get really high. - Basic theory. Where do we get the power to fly. - Determining you current level. Can you go 15 meters high after 2 hours or....some work needed. - Basic Stance elements (also see The Stance section). - Mastering transition jump as a good start. For those, not looking for excessive height so far, but looking for the Style. - Moving further, we are getting to your ... stance. Again. The idea of Powered Up Stance. - Level 1 jumping. Concentrating on really important things. Jumping half way to the top by doing .... nothing. - Progressive edging. Upwind curve. Pop up. All you know about it is ... wrong. Discover How it works. Finally. - Level 2 jumping. Magic timing. Time to buy your Woo device to show them, what you are capable of. The course is up to 5 hours during one camp, depending on your skills and goal. Average course lasts 3 hours = 150 Euro. Do you often feel overpowered or underpowered with your favorite kite size? Do you terrorize your depower rope every minute? 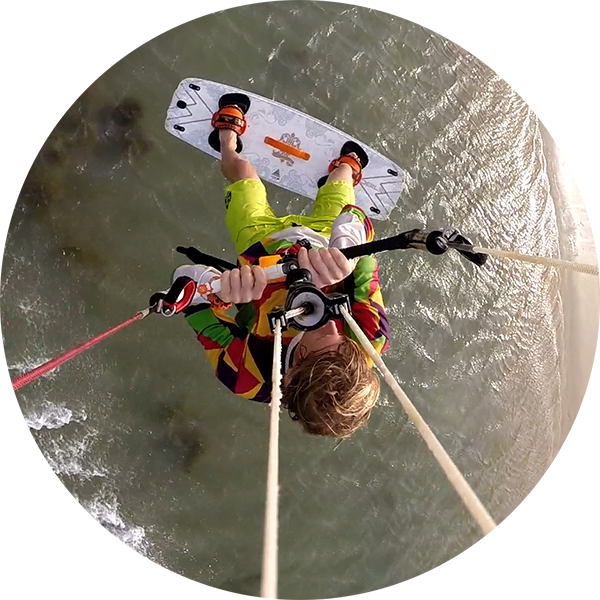 Do you need more than one kite and one board for 90% of conditions you face? Do you have problems with staying upwing, when the wind seriously picks up? Finally, do you have problems with jumping high? If you have one or more "yes", then your Stance is far from being perfect. We have to go through all the skills your kite instructor had to teach you, but he didn't. Or may be he just didn't know it himself? The true meaning of stance is really underestimated by many kite schools. Unfortunately, the official teaching system plants the seeds of wrong stance very often. My Stance program has 2 stages of stance progress and lots of exersices, which will help you to discover a whole new world of riding in effective and stylish stance. Trust me, people will notice you, even you are just cruising along. - Analyzing your stance. Stance is like a fingerprint. Every rider has a unique one. - Basic theory. 10 levels of your Stance building from your toes to your head. - Stance level 1 - hanging on the lines properly. On the beach and on the water. 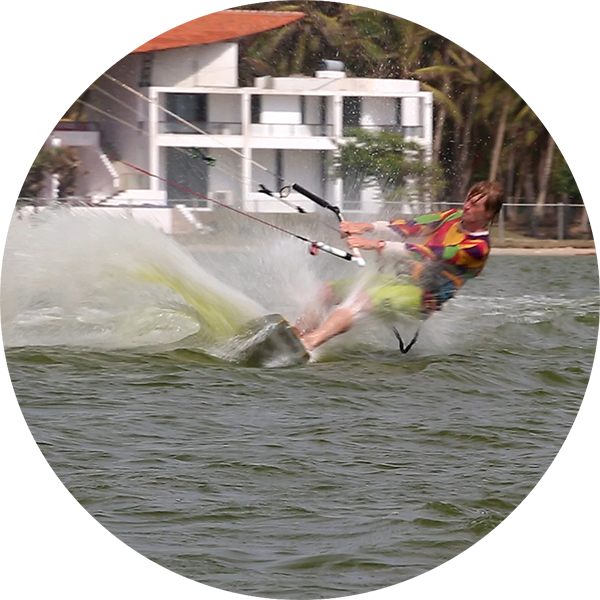 - What mistake 95% of riders do every second on the water? Weight distribution and board diving. - Stance level 2 - Powered Up Stance. It looks so strange, what is the secret? By the way, did you know, how to use your Powered Up Stance to survive the storm on the water and on the beach? - Light wind secrets. The mysterious technique of the Last of the Mohicans Windsurfers. Average course lasts 3 hours = 120 Euro. 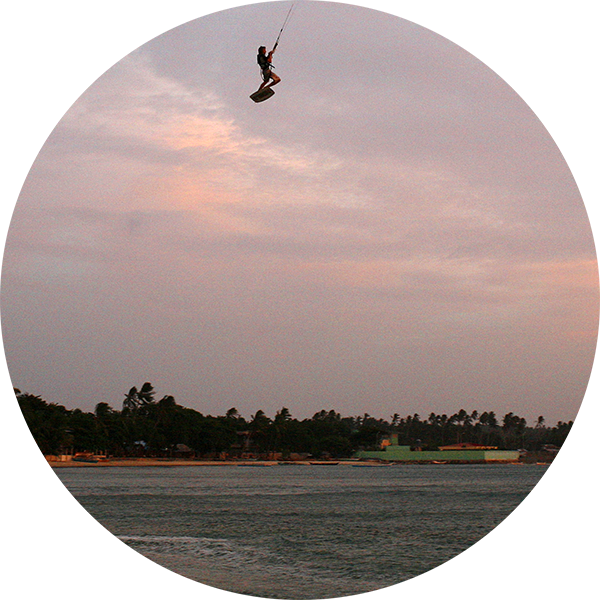 Are you a REAL kiteboarder? For sure! But you've graduated from the kite school quite a long time ago but...something is still missing. Going upwind is a problem when the wind is too strong or too low? Well, it could be OK, but everyone around doesn't seem to have these problems in the same wind. Sometimes it feels alright, but after 10 minutes it all goes wrong, and you can't figure out why. Switching to another size or another board sometimes helps, but sometimes doesn't. 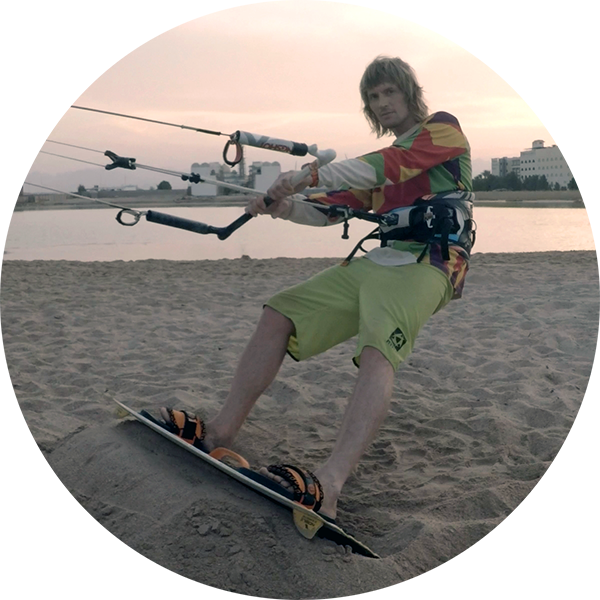 Still using your board-leash because you are not sure, that you are able to recover your board by body-dragging? It works fine, until your leash is not strong enough and it breaks, or it's (worse case) too strong and it brings the board back to hit your body hard. But they don't pay too much attention to body-dragging at the kite school, right? You were learning to ride, not to body drag, after all! ... recover and to carry another one's board to help someone, who's in trouble. ... and many other easy and effictive skills, that can save your time, equipment and health. Average course lasts 4 hours = 120 Euro. What? Everyone knows how to do a backroll. You don't need it. You know how to do it at 1 meter height. 2 meters? 5 meters one-footed? Slow and smoothly? Every transition is a Double backroll one? Or... are those backroll too fast, only low-height ones, sometimes double when you want a single one!!! Slamming your back on the water, mixed up with the steering? Well, there are still a lot of things to discover. Front- and backrolls with a grab or a one-footer, inverted (not half inverted, turtle-style, but FULLY inverted) rotations, double rotations are good goals. But! One single question still seems to be the most important one. How to CONTROL the rotation? And stop the rotation taking control over you. - Basic backrolls for beginners. - Methods of rotation control at lift-off and in the air. What is the difference? - Steering your kite in the air. Methods to use for low, high and multiple rotation jumps. - Backroll transition without sinking. Ways to keep the power in the kite all the way through. - Rotations with a grab or a one-footer. One-handed steering secrets. - Raising up the bar. Your control bar over the water. Rotating higher. - Mastering the super-slow rotations. How slow can you go? I think, that there is a worldwide conspiracy about kiteloops. Everyone knows, that "kiteloops are dangerous" and all you need is "to have guts", if you want to master them. Who has ever told it to you? Do you remember his face? No, they are deep in the crowd. Hiding. Faces are blurred. Keeping the secret of the Kiteloop safe. But don't be the one to fool. Open your eyes. Join the underground community of kiteloopers. Step by step you will learn to use this brilliant kite maneuver not only to impress the girls on the spot (the main purpose of kiteloops), but also to softer your landings, avoid collisions with other riders, do smooth transitions, travel downwind, surf the waves and even to start going in low wind. You don't need too much of guts, just some techniques. Soon you'll be able to do it on any kite size, in any wind conditions. - Kiteloop theory. Which kites are better for different types of loop. Let's test your kite. - Setting up the kite (if necessary). - Different types of steering you can use to loop the kite. - Surface loops. Easy, but sometimes it stucks a bit. Let's fix your problem. - How you can use your surface loops to improve your riding. Skills they should teach everyone at kite schools. 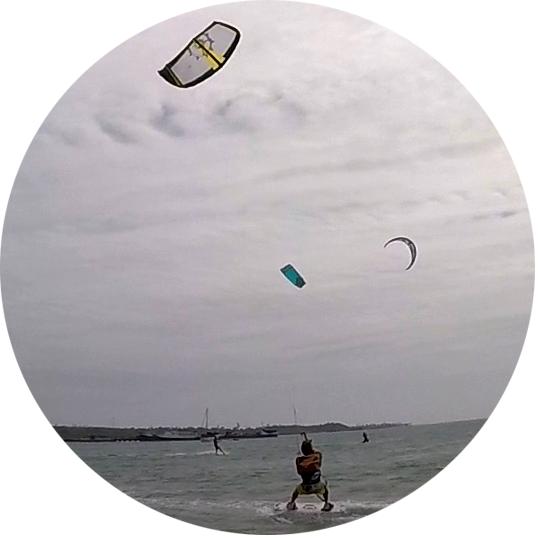 - Low wind kiteloop tricks.